Abstract: Ever wonder how an LED light bulb is made? Not the tiny coloured lights, but the big, bright, solid state light bulbs gradually replacing incandescent and compact fluorescent lighting everywhere? Ever wonder how an LED light bulb is made? Not the tiny coloured lights, but the big, bright, solid state light bulbs gradually replacing incandescent and compact fluorescent lighting everywhere? Thanks to an offshoot of the Taiwanese firm Glacialtech, which makes PC power supplies and heatsinks, PCSTATS has put together a virtual factory tour of its GlacialLight LED lighting plant situated in DongGuan, China. As it happens, the computer industry is well suited to LED light manufacturing. The process isn't a whole lot different than making a computer motherboard, so follow along as PCSTATS takes you on a guided tour of a LED lighting factory! LED technology has been around since the late 1960's, and for the first 40 years LEDs were primarily used in electronics devices to replace miniature light bulbs. Within the last decade or so, advances in the technology finally boosted light output high enough for LEDs to begin to seriously compete with the light bulb - technology that's a +100 years old. The word LED is actually an acronym for Light Emitting Diode, a solid state electrical circuit that, in simplified terms, generates light by the movement of electrons in a semiconductor material. LED lights are very energy efficient, but several challenges need to be overcome before most people will be happy to part with inexpensive incandescent and relatively energy efficient compact fluorescent light bulbs. The foremost is quality of light. Compared to a regular incandescent light bulb, white light produced by LEDs can have an unpleasant bluish or purple tint. As with most technologies, each successive LED generation improves light quality, the amount of light output per Watt, and reduces cost and heat. The age of solid state general purpose lighting is quickly approaching. Glacialtech make computer CPU heatsinks and PC power supplies, so it's not surprising that the company recently expanded into the growing market for solid state LED lighting products. In North America LED architectural lighting is just beginning to take hold, but if you've visited Hong Kong, Shanghai or any other major city in China you will have witnessed multi-coloured LED lighting decorating every skyscraper on the horizon... Not to mention those friendly green digital count-down crosswalk signs, store lighting, and countless red vehicle tail lights. 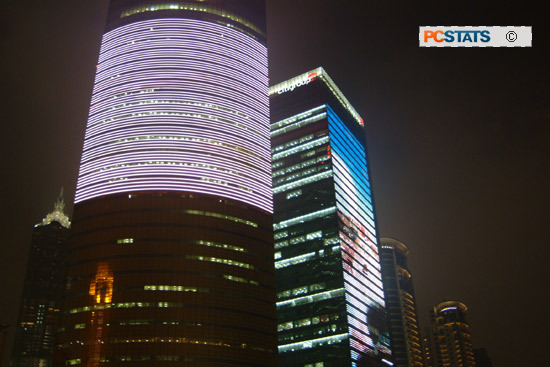 Building-sized LED lighting for full motion advertising in Shanghai, China. An LED light consists of four essential components; the LED circuit board, a heatsink and power supply, and shell. The lights start out as bare printed circuit boards (PCB) and high luminance LED elements arrive from separate factories which specialize in making those components. LED elements themselves create a bit of heat, so the PCB used in lighting fixtures is a little special. Instead of the standard non-conductive sandwich of epoxy and fiberglass, the circuit board is laid out on a thin sheet of aluminum which acts as a heatsink. The aluminum PCB used in LED lighting is coated with a non-conducting material and conductive copper trace lines to form the circuit board. Solder paste is then applied in the right places and then SMT machines (Surface Mount Technology) place the tiny LED elements, driver ICs and other components onto the board at ultra high speeds. The round shape of a traditional light bulb means that most LED printed circuit boards are circular, so for ease of handling several of the smaller circular PCBs are combined into one larger rectangular PCB that automated SMT machinery can handle. Think of it like a cupcake tray moving from one machine to the next along a conveyor belt, then at the end the individual cupcakes are snapped free from the tray. Once the larger sheets of LED circuit boards have passed through a solder reflow oven (a hot air furnace that melts the solder paste), they are broken up into the individual small circuit boards and power wires manually soldered on. The small power supply housed in the body of the light bulb goes through a similar process, or may be delivered complete from another factory. 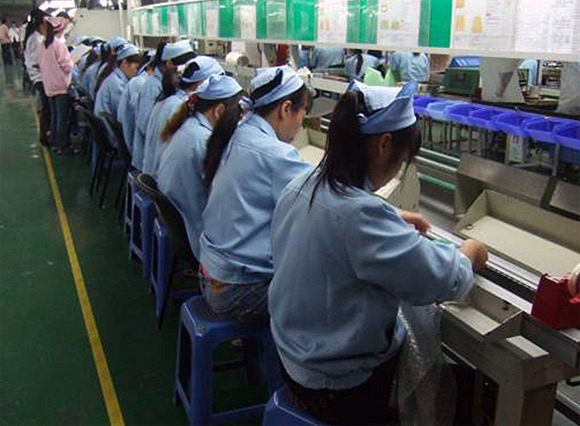 In either case, the manufacturing steps are the same; first the PCB passes through SMT lines, then it goes to a manual DIP assembly line where a long row of factory workers add one component at a time. Follow along as GlacialLight factory works assemble a BR30 LED spotlight. The light draws about 10W and outputs between 360lm to 540lm depending if 6W or 9W LED elements are used. Colour temperature is rated at 3000K or 6000K, depending on the model. Life expectancy is 35,000 hours. Surface Mount Device (SMD) Line.